The Greater Cederberg Fire Protection Association (GCFPA) in collaboration with CapeNature and the Fire Brigade Services of the West Coast District Municipality hosted a successful veld fire awareness day. Landowners and employees of eight (8) Contract Nature Reserves of the Greater Cederberg Biodiversity Corridor attend the day on the 16th of August 2017 at Redelinghuys. Contract reserves are proclaimed on properties with high biodiversity value under the auspices of the CapeNature Stewardship Program. Seventy six people attended the extremely successful day. Proceedings of the day focused on increasing awareness levels of landowners and their staff regarding the elements of fires, the causes of veld fires and how to prevent them. The legislative aspects and how to fight fires safely was also discussed. General fire safety on farms and homes were presented by David Frederick a Crew Leader of the Working on Fire Programme in Porterville. Staff members were also shown how they must react if their clothes start to burn. The Fire Brigade Services of the West Coast District Municipality emphasized the important role landowners must play during fire-fighting operations and appealed to all landowners to report fires immediately at ph. 10177/022 433 8700. It was also emphasized that no controlled burns can be executed without a valid Burning Permit. These permits are free for GCFPA members and can be obtain from the West Coast Fire Brigade Services at 022 433 8702. 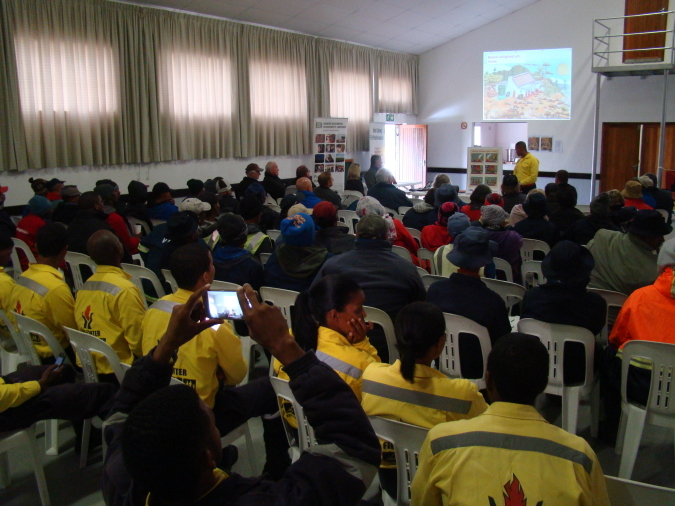 The presentations were very interactive and the landowners and their staff were constantly asking questions, this indicates that veld fires are a huge risk to the area and needs constant management actions in order to avoid runaway veld fires that can cause damage to social, economic and ecological assets. An integrated fire management plan for the region is currently in a draft format. The Working on Fire team of the GCFPA preformed a roll play that illustrate how easy a fire can result from the negligent behavior and actions of people. A practical demonstration was done on how to fight veld fires. The staff of the various contract nature reserves also had the opportunity to learn how to use the firefighting equipment. They will all received a certificate of attendance for being present and taking part in the day’s activities. It is extremely important that landowners and their staff are aware of the risk associated with veld fires, especially under the current exceptional dry conditions. All landowners are called upon to take the necessary precautions to safeguard their property against veld fires. For any help, advice or assistance or how to join the GCFPA, please visit the GCFPA website (ww.cederbergfpa.co.za) or our Facebook page for more information. The GCFPA can also be contacted at ph. 022 931 2083. The extremely successful day ended with a demonstration of Working on Fire’s fire truck, after which several participants had to find some dry clothes. CapeNature and the GCFPA would like to thank all those involved and especially Conservation at Work and the Table Mountain Fund that sponsored the day’s event.